Cat pregnancy is a natural part of an unspayed female cat's life. This page has some general info about pregnancy in healthy felines. For more detailed information, see the related resources below. How Can I Tell if My Cat is Expecting? During the early stages (about the first two weeks), you won't be able to notice any difference at all. At about the third week, you may be able to notice some symptoms. By the fourth week, you'll almost definitely be able to tell that your healthy kitty is expecting. Feline gestation is about 63 days, although it can vary from 59 to 71 days, or thereabouts. If you think your kitty may be pregnant and you are not sure, see cat pregnancy symptoms for a timeline and a list of signs to look for. 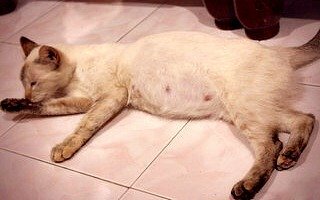 Pregnant cats are not sick pets. This is not an illness. It's a normal phase of a feline's life. If it's your kitty's first time, she may be a little nervous already. If you start to worry or treat her differently, she will pick up on your anxiety and this will make her more nervous and may affect her health. During the early stages, caring for your kitty will be no different than usual, although you may want to add a pregnancy supplement to her diet. During the later stages, you will want to take extra precautions to make sure that her dietary and nutritional needs are met, and that her exercise and grooming needs are met, too. You'll also want to keep her indoors during the later stages so that she doesn't choose an outside location to give birth to her kittens. During the later stages, your feline friend will start to look for a location to give birth to her kittens. You can help her and her kittens' health by providing the ideal location for her to give birth. At the minimum, indoors is the safest place to give birth. Ideally, (and to protect things like your favorite sweater drawer!) you can make a "kittening box" for your pregnant momma-to-be and place it in a warm and draft-free location in your house within sight and sound of familiar household activities. Should I Allow My Cat to Get Pregnant? Cat pregnancy is a normal part of a female cat's life. However, in my opinion, it's best to have your feline companion spayed (and have your male cats neutered) so that we can decrease the number of homeless kitties in the world. Many people believe that it is best for their female cat's health to experience at least one pregnancy. Veterinary research does not support this belief. Felines live a very healthy and happy life without ever giving birth to kittens. However, if you have decided to allow your kitty to become pregnant or you find yourself caring for a pregnant cat, it's best to get as much information as you can to help her during this time, and for you to feel more confident about taking care of your cat.